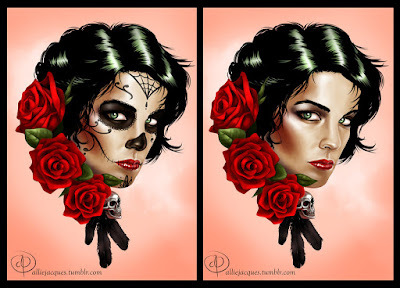 Día De los Muertos. I found a really talented artist on Deviant Art who's drawn a girl that best fits the description of what I'm going for! Check her out here! I tried this look once quickly as a test run at my friend Megan's, the mermaid! (Note, I had to use white eyeshadow as I hadn't yet bought my white face paint, and next time I'll be drawing some pretty swirly lines on my face to add more detail to the look. But enough excuses, here it is! Megan and I also had a trip to Wilkinsons as part of an epic search for activity colouring books for her 4 going on 14 neice, and I ventured over to the Halloween section and found some goodies for my outfit. I also got a couple of bits from Claire's Accessories too! Please leave a comment below about what you're going as for Hallowen, and have fun whatever you're doing! !